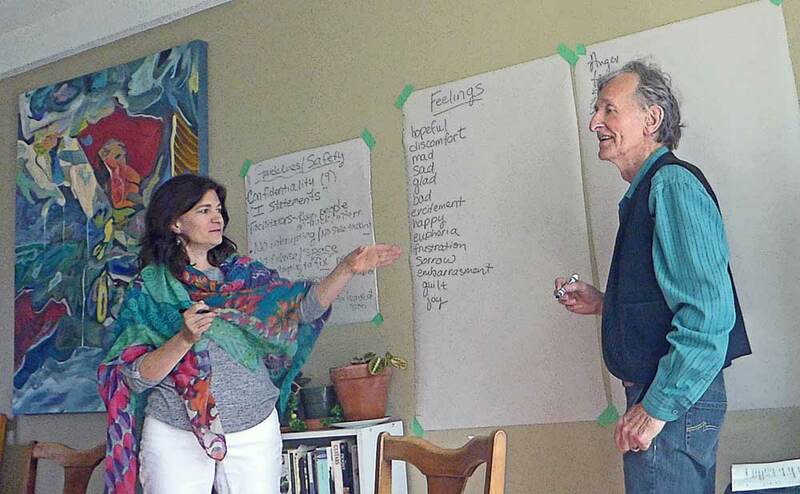 I offer a one-day workshop in emotional intelligence. Every time there is a thought there is a feeling. For many people these feelings are unconscious and only partially revealed by facial expressions, body language and tone of voice. These signals are often misinterpreted. Self-awareness is knowing what you feel, being able to identify and describe your feelings beyond the grey scale of good bad or somewhere in between. ‘Good’ does not distinguish between calm and excited and ‘all-right’ does not necessarily mean contented. Once we know what we are feeling it is possible to ‘own’ our feelings, accept them as our response to the situation often rooted in our past experience. In the same situation often different people feel differently. This is because feelings are arising in relation to the story we are telling ourselves about what is happening which contains assumptions which are not necessarily correct. Owning feelings is the essence of empowerment. Before I learned this I was a victim of circumstances, a puppet on strings held by others. Afterwards I could say, “I am the captain of my soul.” Whatever you feel is okay but if it is negative it is your problem. Grief is an experience shared by all sentient beings in response to a loss. A model of the grieving process talks about four stages, denial, anger, sorrow and acceptance. Denial is numbness but is also unawareness of feelings. Addictions can keep us stuck in denial. Blaming others is not taking responsiblity for our feelings and can keep us stuck in anger or depression. Conversely, sharing these feelings with others who can hear them helps us move through them to the place of acceptance. Sharing feelings with others also generates emotional intimacy and connection which compensates for loss. Taking responsibility for my feelings gave me the additional benefit of not taking responsibility for other people’s feelings. Not knowing whose feelings are whose is a symptom of codependent relationships. Hearing other people’s feelings of grief now feels like a gift not like a burden.